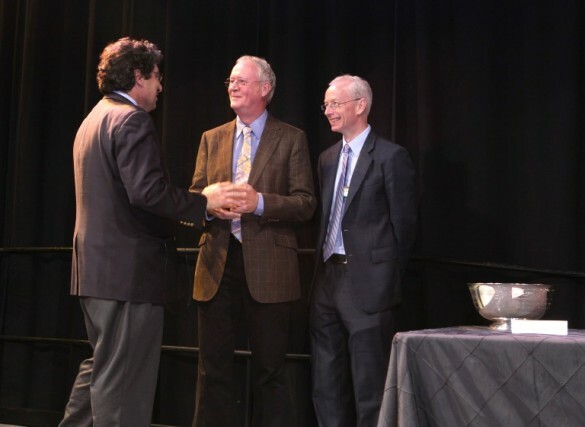 John Gore accepted the Earl Sutherland Prize for achievement in research and Gordon Bernard won the Thomas Jefferson Award for distinguished service to Vanderbilt University at the Fall Faculty Assembly. 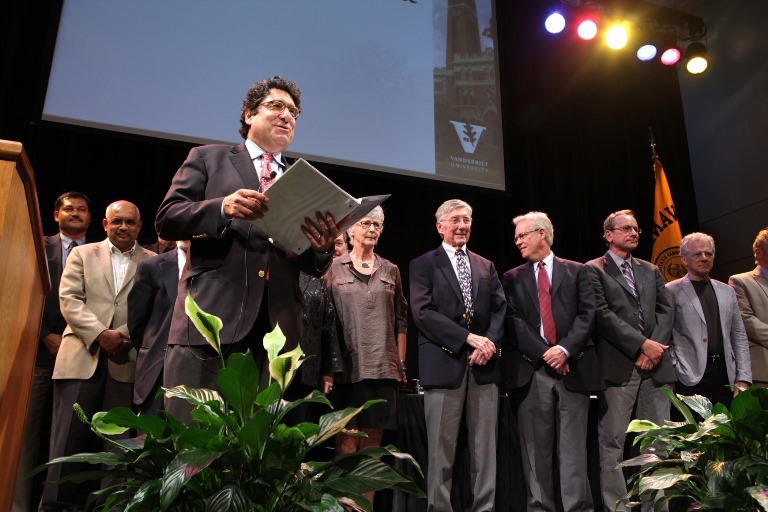 “John’s pioneering scholarship in the field of magnetic resonance imaging and research has transformed Vanderbilt in numerous and important ways,” said Chancellor Nicholas S. Zeppos, who also delivered his biannual state of the university address Aug. 22 at the Student Life Center. “(Gore’s) work has laid a strong, enduring foundation for the Vanderbilt University Institute of Imaging Science, which is nationally recognized as a highly successful research enterprise,” Zeppos said. Gore is University Professor of Radiology and Radiological Sciences, the Hertha Ramsey Cress Chair in Medicine, professor of biomedical engineering, professor of physics and astronomy, professor of molecular physiology and biophysics, and director of the Institute for Imaging Science. He received an engraved pewter cup and $5,000 with the honor, which recognizes a faculty member whose achievements in research, scholarship or creative expression have received significant critical acclaim and are recognized nationally or internationally. Bernard, associate vice chancellor for clinical and translational research, won the Thomas Jefferson Award for extraordinary contributions in the councils and in the governance of the university. The honor comes with $2,500 and an engraved pewter goblet. Vivien Casagrande for a paper in Nature Neuroscience identifying a novel linkage between previously dismissed areas of the visual cortex and the thalamus, which controls the ability of the visual system to focus. Daniel J. Sharfstein for his book The Invisible Line: Three American Families and the Secret Journey from Black to White.